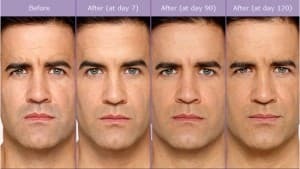 Women aren’t the only ones who want to look younger — many men would like to slow the aging process and are concerned about their appearance, now more than ever. Men are prone to furrowed brows and frown lines caused by stress, which can prematurely make them appear older than they are or older than they feel. Receiving BOTOX® Cosmetic is a simple procedure in which men can partake during their lunch hour. The duration of the injection lasts around ten to twenty minutes, and the effects are immediate and last for months. To maintain the look, touch-ups are necessary, but there is no need for anesthetic or daily routines — in short, there are no significant hassles, something most men actively avoid. The procedure has become so popular amongst the male population that it has even gotten a nickname: Brotox. Clostridium Botulinum toxin type A is supplied in a manufacturers vial containing 100 units of vacuum-dried neurotoxin powder complex. A practitioner can not inject a powdered substance through a syringe so in order to be able to inject these active units of Botox®, saline must be added to get BOTOX® in “liquid form.” This process enables the Botox® to be extracted from the vial into the syringe and then injected. At New Radiance Cosmetic Center of Palm Beach, we make sure we reconstitute (the process of adding saline to the active ingredient) the BOTOX® solution in front of our patients in order to instill confidence and peace of mind. Interested in trying Botox? Contact us today in order to set up a complimentary consultation with one of our trained experts. To learn more about BOTOX® and other neuromodulators, click here.